Le Cellier wine racks are as elegant as they are practical. 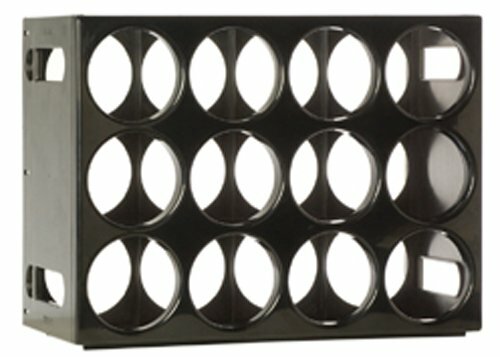 Sturdy enough to hold twelve bottles of your finest in one rack. And it costs less than a good bottle of wine. So, if you appreciate fine wine, you'll love Le Cellier. Features of the Le Cellier wine rack, assembles in a minute or less (no tools necessary). Made of durable ABS plastic. Available in black, red, tan or dark brown. Self-supporting or has slots for brackets to attach to wall. Modular, stackable elements, yet beautiful as a single rack. Retail $29.95. Free $18.95 copy of the complete idiots guide to wine with every wine rack. Dimensions 16-3/4-inch wide by 12-1/2-inch high by 8-1/4-inch deep bottle hole diameter 3-3/4-inch. Patent pending. Made in the USA. If you have any questions about this product by Le Cellier, contact us by completing and submitting the form below. If you are looking for a specif part number, please include it with your message. Wine Racks America Ponderosa Pine 18 Bottle Stackable. 13 Stains to Choose From!